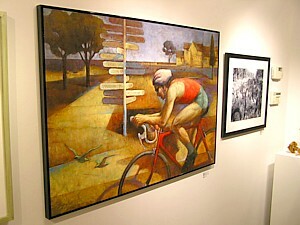 Saturday was the big day for the BIKE art exhibit. I had organized a ride to the show from Savage Mill Tavern. Seemed like a good location for the local people and the ones coming up from the DC area. Jay, Ken and I set out from my place for the 15 mile ride to the start with a head wind pretty much the whole way, but the weather was nice as the sun was getting low in the sky. Low traffic back roads made up most of our route so it was pretty smooth sailing. We rolled up to the parking lot right in time, gathered everyone up and set off shortly, about a dozen of us pedalling into the evening. After about a mile Jay's rear fixed hub stripped. Fortunately we weren't in to the ride to deep and he limped back to the parking lot, borrowed my wife's car and drove over to meet us. In the meantime the rest of us bobbed and weaved through a spiderweb of bike paths that led us over bridges and through the woods. Nine miles later we arrived at the show and proceeded to create our own sculpture in the form of a bike pile. When we went into the gallery things were already underway and I was overwhelmed by the amount of people there. It was packed and you could barely move. In short order I found a beer and we tried to get a look at all of the works. It wasn't easy with so many people, you had to be patient and sometimes come back to get a look later. Lots of really great works: paintings, collage, sculpture, photos, it was all represented. There was even a full size crocheted bike. When the awards were announced the Disco Cowboy got an honorable mention for a cool action photo that he had in the show. Judging must have been tough though, there was lots of good stuff. The 1st place winner is pictured above. After a few beers we rolled out after the official closing of the show and hooked up the lights. By now the glow bracelets I had handed out at the beginning of the ride (and were wrapped to various bike parts) were visible and allowed us to become a moving work of art. Legs pumping, wheels turning, lights blazing and streaks of blue, red, purple, green and orange phosphorus trailing through the night. Back to the bar to chow down and drink up, the night wasn't over yet. If you missed the show Saturday night, you can still catch the exhibit through Novemeber 20th. There will also be another event for the show, called An Afternoon with the Bicycle on November 19th, featuring the author of the book Bicycle: The History. See this link for details. Sunday morning called for dirt. Todd and a couple of his co-workers from the League of American Bicyclists came up and Jay and I gave them the Avalon tour. It was simply one of the best falls days I've seen. Of course, it could be the fact that it's rained a lot lately and my trail time has been diminished, but I that can't account for the warm sunshine and the great temps. We gave the boys a pretty thorough showing of the trails, rode for 3+ hours but left some stuff for the next time. They weren't disappointed. In fact, they were wondering why they had waiting so long to make the short trip out here. Good guys to ride with and they were hanging tough on the technical sections.